Coracora (in Hispanicized spelling) or Qura Qura (Quechua qura herbaceous plant, the reduplication indicates that there is a group or a complex of something, "a complex of herbaceous plants") is a town in central Peru, and it is the capital of the Parinacochas Province in the Ayacucho Region. It is located 800 km from the city of Lima, at an altitude between 3,150 and 3,350 meters above sea level, known as the Quechua ecological region. Dry and sometimes cold, in the day it resembles a mild summer day, but in the night it resembles a freezing cold winter. The days are usually something mild between +12 and +18 °C and at nights between -5 and 5 °C. The winter season is manifested between June and September with frequent frosts, and the temperate and very rainy summer between December and March. Founded by the Spanish conquerors toward the 17th century, probably on an Amerindian Andean settlement, soon a population of important European origin, will developed in what was the road between Lima and Cuzco. It proves of they are it old such colonial constructions as the beautiful local church of Baroque and Renaissance style, built in white ashlars. 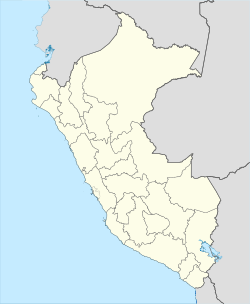 Nevertheless, it was in the 19th century and it leaves of the 20th one that Coracora became one of the flourishing cities of the Peruvian south mountain, thanks to the export cattle raising that could gather an important number of local managers and European immigrants. Toward the decade of 1940, Coracora reached a not very common cultural and economic peak for a small city mountain Peruvian, this prosperity began to vary in the decade of 1980 in direct relationship with the social violence of those years in the whole country. At the moment it has recovered their character of center cattleman, commercial and tourist with important improvements in access roads, infrastructure and services. In the beginning of August, Coracora celebrates the devotion of La Virgen de Las Nieves, or known as "Virgen of the Snow". The days that they celebrate are August 1–12. August 1: People make preparations for the festivities. They make food for the whole family. August 2: People walk to Pumahuiri (the mountain that the Virgen of the Snow was found). Los Negritos (kids that dance and sing for the Virgen of the Snow) People sing and dance as they walk to Pumahuiri, and the songs are also prayers. August 3: Is the Entrada de Negritos(Entrance of the Blackies). The kids, as they were mentioned before, walk into town and keep singing and dancing as people follow them just as they did on their way to Pumahuiri. August 4: On this day it is the Entrada de Chamiza, Entrance of Retama. It smells really good, they are brought on donkeys' and llamas' backs. At night people burn this dry plant. People dance around it with the rhythm of the band that plays all night. On that same night they have Los Castillos, or fireworks on wood, in the Main Plaza, Plaza de Armas. Also they have serenades with people dancing and singing. August 5: Is the main day of the festivitie day. On this day the whole town walks around the main plaza where the church is located. August 6–8: On this day, the city is going to the bullring. Each family has its own place and pay for it. Every square foot is $200.00. 12 bulls each day not being uploaded, rebellious, and bulls calm. People buy the bulls in honor of Our Lady of the Snows and the ofresen estimate the person (compadres). It is something like a donation. If the bull does not die the person who bought it and the person receiving it enters the bullring called pucachucos. they are pure red dresses people who enter leading a team of bulls. to remove the dead bull in place, leaving the rruedo. Sivén happen to be the home of the bull who resivio. and exquisite taste of a steak. Each year, a person must sign up to be in charge of the town festival on August 5. Spaniards had a specific job to bring the statue of the Virgen. Their destination was to Cuzco, but along the way they had stopped in Pumahuiri. Their route was really from lima to cuzco, but Pumahuiri was a long and very tiring mountain, so they stopped and rested. But one man of the many had a dream of the Virgen of the Snow telling him about a town, she had wanted to stay in that town, not Cuzco. That town was Coracora. When the man awakened, he told his fellow mates about his dream. They believed on what he had dreamed so they climbed down the mountain and took the Virgen to Coracora. Since the men that carried the Virgen Mary down the mountain with hope and honor, the small Negritos are supposed to represent the slaves black men that carried the Virgen Mary. This page was last edited on 28 October 2018, at 17:54 (UTC).